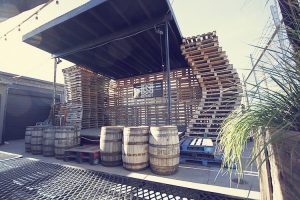 Black Shirt Brewing Company is located in the River North (RiNo) district in Denver, near the intersection of Walnut and Downing. Just north of the brewery, maybe a couple hundred yards away, is a stop for RTD’s A-Line Light Rail line. Many travelers either heading out to DIA or coming from DIA to Denver, stop at Black Shirt Brewing to try a fresh Colorado craft beer. 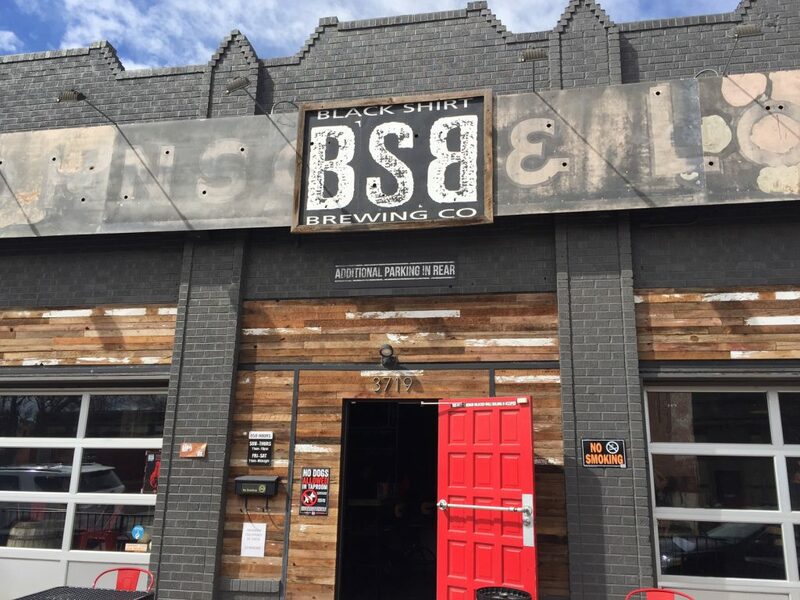 Due to their unique location, Black Shirt has loyal fans all over the country that enjoy stopping in when they visit Colorado. Black Shirt is one of the must-try breweries in the Denver area whether you live nearby or you’re planning to visit from another state. Black Shirt Brewing Company’s story began in 2011 when brothers Branden and Chad Miller along with Chad’s wife, Carissa, decided it was finally time to realize their dream of owning a brewery. The siblings had the idea to make this happen as far back as 1999, but like they say, “good things take time”. With help from Carissa’s brother, Aaron Holstad, they worked long hours to transition the old brick building into a functioning brewery. The building is thought to be from the 1920s and there are varying stories as to its exact history. From a furniture store in the 50s to a disco in the 60s-70s, to a brothel sometime along the way (not confirmed), the building had a lot of history. The owners worked hard to begin the next chapter for the building as it transitioned to a brewery. For nearly two years (one year, 9 months) Branden, Chad and Aaron worked to renovate what they could as they were paying for improvements as they went. Due to the fact they had a small budget, every single piece of the brewery was touched by one of the three. There are some really cool touches to the construction that have unique stories. For instance, the barn wood was brought in from Branden and Chad’s hometown. Black Shirt Brewing Owners Branden and Chad Miller are Colorado natives, having grown up in the Southern Colorado town of Westcliffe, CO. They will proudly tell you that they are in fact, 5th generation Coloradans. The brothers gravitated towards skateboards and the music of Johnny Cash, while preferring their clothes to be black. It wasn’t what all of the popular kids did, it was what Branden and Chad did. When they decided to open the brewery, Branden and Chad thought it was important to stay true to their style and design things to fit what they liked. When you walk in Black Shirt Brewing, you quickly notice pictures of Johnny Cash and many references to music on the walls. You will hear music playing and it might just be coming from the back patio. One of the questions we like to ask at Colorado Craft Brews is what makes a brewery unique from the others. For Black Shirt this is an easy question to answer. 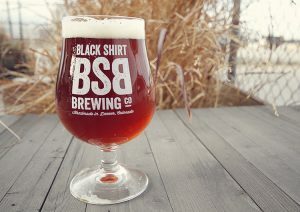 Black Shirt specializes in Red Ales, a style of beer that is an uncommon focus among most breweries. Sure, most breweries brew a Red IPA from time to time, or a Red Ale for a seasonal, but very few focus on primarily brewing Red Ales. When we asked Branden Miller why he chose to brew Red Ales, he quickly told the story of his dad and the fact he believes it’s best to one thing and do it better than everyone else. 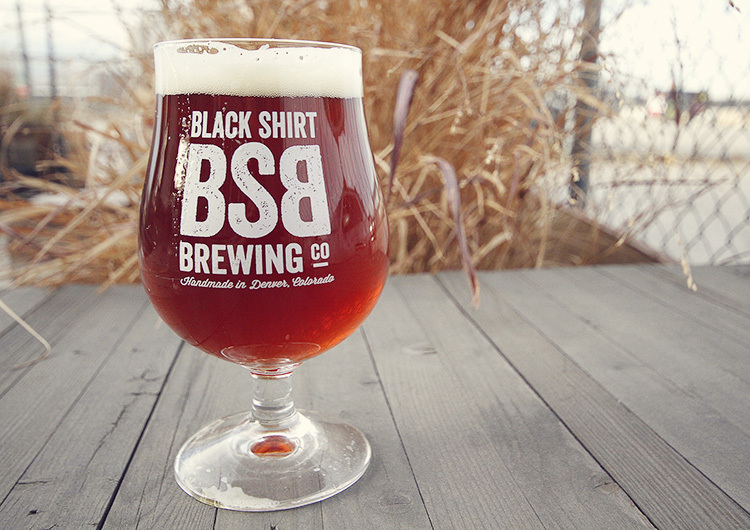 Branden and Chad decided to pursue brewing Red Ales for a number of reasons. Colorado is a Spanish adjective that means “red”. Early Spanish explorers named Colorado for the red that could be found around the state. A great example of this is the area in Southern Colorado where Branden and Chad grew up. This area is known for being the home of the Sangro de Christo Mountains. Sangre de Christo means “the blood of Christ” in reference to the red hues of the mountain range. Branden thought Red Ales were being done well but there was definitely room for improvement. Ultimately, it seemed fitting that in a state known for its red soil and red rock formations, he could brew Red Ales and brew them better than anyone else. We sampled a number of Black Shirt’s beers and were impressed by the variety and quality of the samples. While difficult to pick a favorite, we thoroughly enjoyed the Frontmaniac IPA. Hop lovers will enjoy this big, bold IPA with a smooth finish. The Baritone Black IPA stood out for the earthy, piney notes – definitely a beer we will be trying again. The Colorado Red Ale (Black Shirt’s flagship beer) has floral and citrusy notes that make it a favorite for American IPA drinkers. If you prefer lighter, less hoppy beers, the Semitone Saison, Common Red Kolsch are great options. One thing we noted in trying some of the higher ABV (alcohol by volume) beers was that they were not overpowering, each was smooth and balanced. Often times, higher ABV beers can be either too hoppy or too malty. Overall, we enjoyed the tastings and would recommend Black Shirt’s beer to anyone from craft beer fanatics to those that are looking to try craft beer for the first time. Black Beacon Storm Nitro – Imperial Stout: 8.5% abv – Imperial Rye Stout aged in a variety of bourbon barrels. Frontman IPA – IPA: 7.3% – A mic’d up, hoppy and loud IPA brewed w/ Chinook, Simcoe and Mosaic Hops. Black Shirt Brewing distributes their beer in many liquor stores around the metro Denver area. You can also find Black Shirt in a handful of mountain towns including, Buena Vista, Gunnison, Salida and Crested Butte. If you want to find a location near you that sells Black Shirt’s beer try their beer locator. The best way to enjoy a Black Shirt beer is to visit the taproom. If you can make it on the first Wednesday of the month, you’ll be able to try a new release beer and help raise money for local charities. $1 from each sale of the special release beer is donated to a local charity. If you are not able to make it on the first Wednesday, you can still try the new release beer for the entire month, until the next special release (and your purchase still helps raise money for charity). We mentioned that you may hear music coming from the beer garden at Black Shirt. They have a stage in the back that is a hot spot for artists in the local music scene. From Memorial Day to Labor Day, Black Shirt hosts live bands on the stage and welcomes fans to enjoy music with a fresh craft beer.Be sure to check the schedule as there are many events going on throughout the spring and summer. We would like to thank Branden Miller for taking time to chat about Colorado craft beer. It was apparent in our discussion how passionate Branden is about brewing high quality beer. We encourage anyone reading this to make a trip to Black Shirt Brewing to enjoy a delicious beer, you won’t be disappointed. If you would like to learn more about how they got their start, you can see Black Shirt in a craft beer documentary called Crafting a Nation. 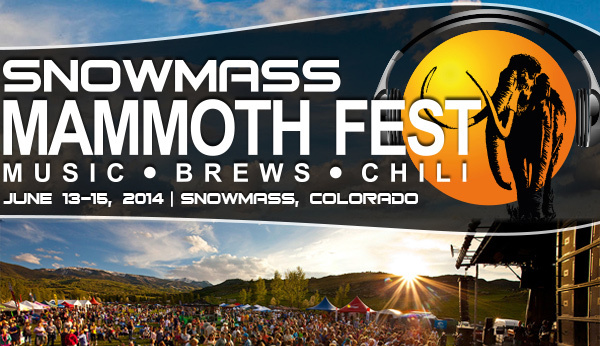 The Snowmass Mammoth Fest, formerly Snowmass Chili Pepper & Brew Fest, returns for its 11th year on June 13-15, 2014 in collaboration with Snowmass Tourism. Tickets are on sale now. The Colorado summer festival season kicks off in Snowmass Village at this year’s Snowmass Mammoth Fest. Snowmass Mammoth Fest is proud to announce that Chris Robinson Brotherhood, and Leftover Salmon, will headline the event this summer. Additional musical artists include Xavier Rudd, Les Claypool’s Duo De Twang, The Motet, Nathaniel Rateliff, Bonerama, Houndmouth, Royal Southern Brotherhood, Wheeler Brothers, The London Souls, Miner, and local DJs Berkel Beats, and Echo Da Funk. Snowmass Mammoth Fest will include great music and food, but don’t forget about the brews! Come celebrate the Grand Tasting on Saturday, June 14th from 2:00pm to 5:00pm in the festival grounds where 25+ breweries will participate with over 50 different beers. Come sample some tasty brews from your favorite breweries on Saturday afternoon while listening to great music in Snowmass Town Park. 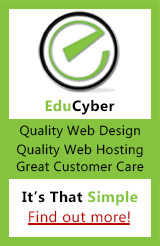 There are options of staying in a local hotel near the event, or you can camp at the event. 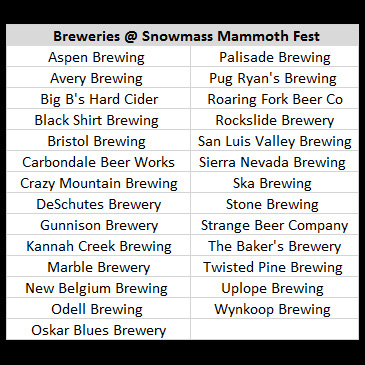 Snowmass Mammoth Fest is coming up pretty soon, so be sure to check out avialability at local hotels here. Snowmass Mammoth Fest is a unique opportunity to be able to camp out at a festival with great music, food, and of course, craft beer. If you’re more interested in camping, check out the options here.